Trujillo Plaza Mayor, Extremadura Spain. Paul Shoul photos. Sitting outside of Medievo cafe on the Plaza Mayor of Trujillo in Extremadura Spain an old friend and I ordered another round of Havana Club rum and coke. 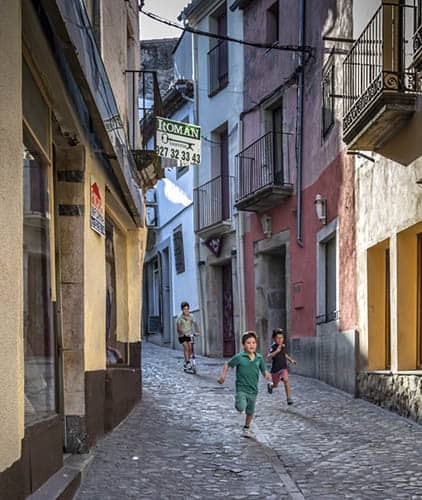 Children play on the streets of Trujillo. As is the custom with a mixed drink in Spain, the waiter pours the rum first and will keep pouring until we say “when!” With each new drink, another tapa appears. It could be local olives or papas Brava made with pimentos de la Vera, or fried Iberian pork, courgettes with salt cod, or a hundred other local specialties. The places with the best tapas are always full. You see, the Spanish have their priorities in order. Ninety-five percent of the people in this bar tonight are locals, many were at a cumpleanos (birthday) ceremony held In the historic Iglesia de San Martin across the square. The tapas may be free, but people keep coming back……for generations. This was such a cool and relaxing scene and everything I love about Spain. Trujillo’s main square is one of the most picturesque plazas in all of Spain. Surrounded by medieval and renaissance buildings, it is mind-boggling to think of all the history that happened here on the cobblestones under where we sit. 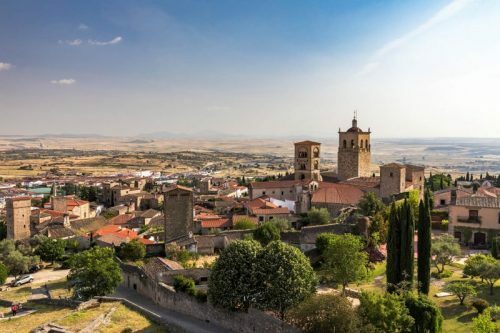 The Moors and the Romans both ruled this region, and then in the 16th century, from this historically poor part of Spain, men set out to conquer the world….and succeeded. In front of the iglesia (church) is a statue of a horse rider, Francisco Pizarro, who along with his brothers conquered the entire Inca empire in Peru. His cousin Hernán Cortés who conquered the Aztecs in Mexico was born down the road in Merida. 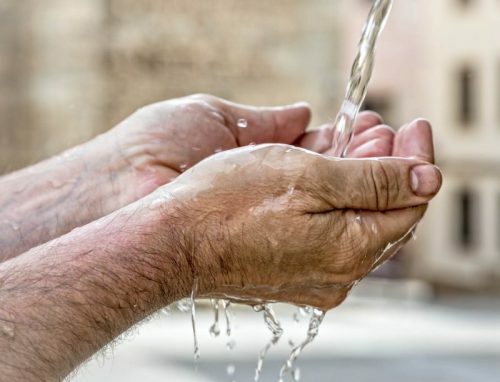 Francisco de Orellana, the first to navigate the Amazon was born here as was Hernando de Alarcon, one of the first on the Colorado river and possibly the first to reach California. This small group of men with the audacity to travel across the globe and take on entire cultures changed the history of our world. It is fascinating to walk in their footsteps. 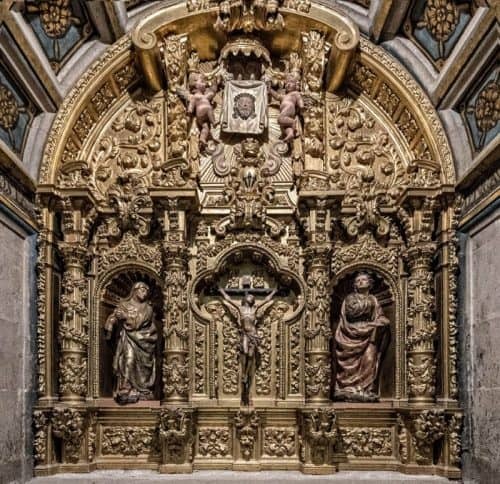 With his new found wealth, Pizarro came back to his home town and helped enrich Trujillo, building the opulent Palace of the Conquest on the corner of the Plaza. From the top of the castle walls, the view of the town and surrounding landscape is spectacular. It feels like a movie set and in fact, is one. This is the set for the home of the Lannisters in the upcoming season 7 of the Game of Thrones. The Parador of Trujillo is close to the city center located in the former convent of Santa Clara. Paradores in Spain are a fantastic value, always located within historic buildings and highlighting the gastronomy of the region. Try the oxtail, it was superb. Parador of Trujillo. You could have a different dinner at another restaurant in Spain, but it could not be better than the one I had at Bizcocho Plaza restaurant overlooking the Plaza Mayor in Trujillo. A ten-minute walk from the plaza mayor, located in the former Convent of San Antonio. 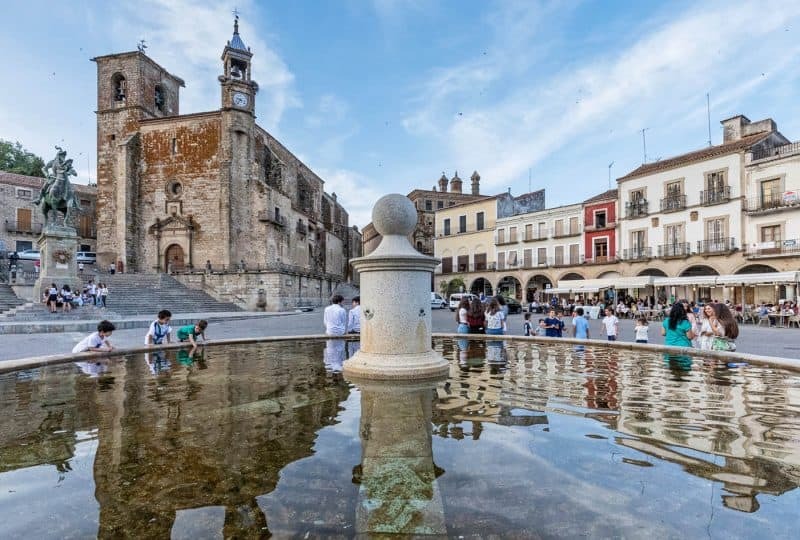 Strategically located on the banks of the Jerte River and Ruta de Plata (the Silver Trail) the walled market city of Plasencia was once ruled by the Romans and the Moors. Founded in 1186, in the 13th century, The Charter of Plasencia declared peace between Christians Jews and Muslims living in the city. Many Spanish Nobles moved here and it became a center for Jewish commerce. 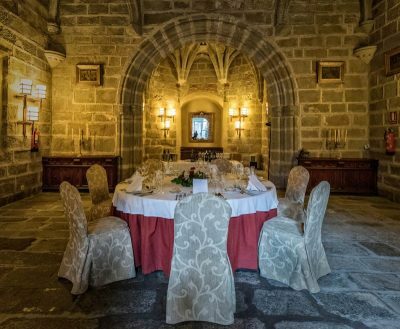 Dinner at this majestic Parador located in the old part of the city in the historic Santo domingo Monastery was nothing less than wonderful. Eating in a private dining room with sommelier Catalina Bustillo at the table threw it over the top. 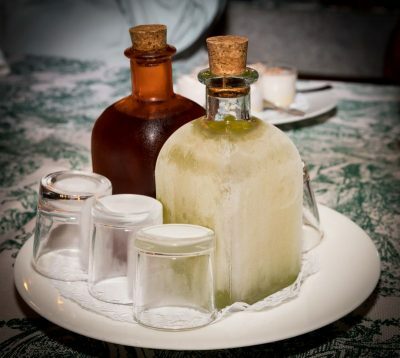 Here is the menu: “ Asparagus cold soup with Iberian ham. Cod loin Monacal style with spinach and potato cream. Iberian pork filet baked with wine sauce and sauteed apple. Torta del Casar with paprika from “La Vera.”Mushroom cod croquette. Smoked trout with avocado. “Zorongollo” – roasted peppers, tomato and garlic with tuna fish belly”. Wowza what a meal. Paul Shoul is a Northampton, MA-based photographer who doubles as a staff writer for GoNOMAD. For thirty years he’s lived in the Pioneer Valley and chronicled life there though his work in the Valley Advocate and Preview magazines. He’s also been seen in the Boston Globe, New York Times, BBC, the Chronicle of Higher Education and many other publications. Today as well as shooting around the world for GoNOMAD he works for local nonprofits, banks and advertising agencies.